Donkeys are herd animals, but unlike horses or zebras, they live in what Sue M. McDonnell of the University of Pennsylvania School of Veterinary Medicine calls a "territorial social system." One male will exert dominance to secure breeding rights with the females, but more than one mature male can live within a dominant male's territory. According to the Donkey Sanctuary Bonaire, wild donkeys establish territories of around 23 square kilometers or about 9 square miles. Within this broad territory, dominant males will tolerate other mature males. For this reason, male donkeys, or jacks, must assert their dominance in order to show themselves eligible for breeding with the resident females. 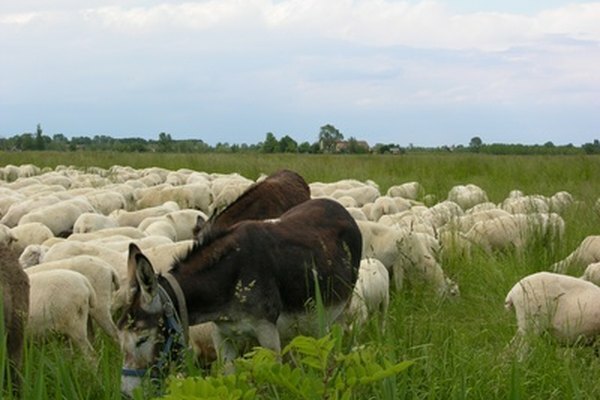 The dynamics of donkey herds differ based on the environment in which they live. According to the San Diego Zoo Library, herd members tend to form more tight-knit, static groups in lush environments. Herds will consist of a dominant male, several females and their young, and several subordinate males. Donkeys living in arid environments rarely remain within a single dominant male's territory. According to McDonnell, single females and their foals will move from territory to territory. Occasionally, several females will travel together, or subordinate males will form small groups. When females are in heat, or estrus, they will mate with the resident dominant male. According to McDonnell, male donkeys establish their territory in two ways: by dropping their feces and by braying. Males will indicate to other males that the females within their territory belong to them by investigating female feces and covering it with their urine. If dominant males encounter subordinate males in their territory, the dominant male will stand erect, with his ears pointed forward. If a subordinate male approaches the females in estrus, the territorial male will chase the intruding male away. Dominant males tolerate the presence of subordinate males and will elicit their help in defending territorial boundaries. Although the dominant male may allow these subordinate males to mate with the females, McDonnell notes that subordinate males do not gain access to the females until after the dominant male mates. In arid environments where resources are limited, Donkeys tend to be more aggressive toward one another. Dominant males will control resources such as water and grazing grounds to ensure they have exclusive access to the resident females. The male will allow females to approach food and water but will defend these resources against intruding subordinate males. Even domestic donkeys show aggression toward other herd members during feeding. According to a study published in the Journal of Applied Animal Behaviour Science, during group feedings 90 percent of uncastrated males and 60 percent of females kick other herd members to gain exclusive access to food. Kicking expresses dominance among the males, while a female's propensity to kick is dependent on whether she is pregnant, lactating or neither. McDonnell states that males will keep groups of in-heat females in close proximity by braying from a specific resting spot. During mating, dominant males choose a favorite resting place near which the females in estrus congregate. The male will alternate between resting and braying and interacting with the females by smelling, touching noses and nibbling. During this interaction, the dominant male will not tolerate the presence of subordinate males in the vicinity of the resting area or the females in estrus. The male's resting area is his sanctuary. According to McDonnell, the male does not allow any other donkeys, male or female, in this area. If females get too close, the male will stand upright with ears forward in a threatening posture, or chase the females away. 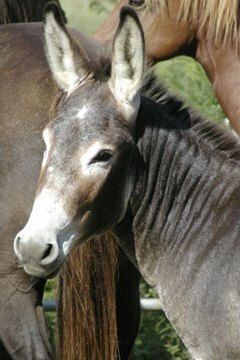 Unlike horses, donkeys cannot run fast enough to escape predators. To compensate donkeys will face down a predator with the same body language used to show dominance among his own kind. Donkeys are especially aggressive towards dogs, and many farmers introduce a donkey into sheep, goat and cattle herds to protect livestock from coyotes, feral dogs and other large predators that pose a threat. Donkeys will bray to warn the herd of a predator and will face down and chase away the attacker while the rest of the herd flees. If the predator persists in pursuing a member of the herd, the donkey will kick, bite, charge at and trample an attacker. Melissa Ruggles graduated from University California, San Diego in 2006 with a B.A. in English literature. Following graduation, Ruggles began work as a technical writer at a construction consulting firm. She has published several articles for "Gurze Books," a small magazine that helps young adults and their parents cope with eating disorders.